What is a white, addictive, powder-like substance that results in harmful physiological and psychological changes in its users? Sugar, of course! Sugar is a difficult topic to write about. It tastes so good, it sells nice-and-cheap, and hey, everyone else uses it too. Unfortunately, this innocent white little substance is becoming a major worldwide health problem and most people don’t even realize it. Like addictive substances such as morphine, heroin or other “opiods”, sugar also directly affects the same centers of the brain. Thus, as many have experienced, it causes an express elevation of mood, energy, and inevitably self-esteem. Following this “high”, there is the crash, similar to other drugs, causing the user to seek out more of the same substance. And this is exactly how addictions work. To sustain the same feeling provided by the flood of endorphins released in the brain people will opt to just get another sugar dosage through convenience junk-food that is widely available internationally in even the most remote of places. From corner stores to vending machines with sugar packed goodies, people do not need to go far to avoid symptoms of withdrawal: Low energy, fatigue, boredom, lethargy, sadness, uncomfortable feelings of emptiness, moodiness, irritability, depression, and many others. So what’s wrong with having an addiction anyways? In principle, so long as one accepts having one, presumably nothing. But the side effects of sugar are where the problem starts. Sugar use effects multiple organs in the body and its effects have been profound enough to change life as we know it. The nutritional value of food per caloric intake has plummeted since sugar has been introduced as an ingredient. What that means is that people are eating more calories and gaining a bunch of weight before they reach their Required Daily Intake. Some people still don’t reach their nutritional requirements. Sugar is empty calories. ‘Empty calorie’ means a caloric food with very little nutritional value. For example, a breakfast fruit bar and a candy bar may have the same number of calories, but where the fruit bar contains fiber and some vitamins and minerals essential to good nutrition, the candy bar may not. Consuming one or the other may actually provide the same number of calories, but the fruit bar will provide you with more essential nutrients, energy and health benefits throughout the day. Consuming too many empty calories will lead to weight gain and because very poor, if any, nutritional value is accompanying those calories, other deficiencies and health problems will also soon result. Generally speaking, sugar should not be part of our diets. It does not carry any of the benefits that food items should, and has many harms. The use of sugar also deludes many people into eating very unhealthily. For instance, tea with a few heaping teaspoons of sugar is a very common site. People drink this sugary drink regularly throughout the day, thus receiving a substantial amount of calories to burn while the “pick-up” effect also keeps them going without any real nutrition. As a result, these people survive off of sugar and caffeine energy and they deplete their essential stores of vitamins, minerals, and other dietary essentials. Unfortunately, nutritional depletion has its limits and it is not long before illness manifests. 1. Sugar has a high glycemic index. That means it is absorbed into the blood quickly and causes a blood sugars to spike quickly proceeded by a drop in blood sugar as insulin secreted by the pancreas helps the cells uptake the sugar in the blood. Other than being difficult and even damaging to the pancreas, rapid rise and fall of blood sugars has been linked to many common health problems. Hyperactivity and Attention Deficit Disorder (ADD) are two good examples. Children clearly demonstrate how humans respond to sugar in the diet. Many responsible parents will withhold how much candy their kids eat due the behavior it produces. They will report children becoming hyperactive, anxious, less focused on their tasks, and cranky after sugar intake. Numerous studies have shown that sugar causes headaches, including migraines, reduces learning capacity, adversely affect school children’s grades and causes learning disorders. As such, many parents have been able to treat a range of difficult behavior in their children simply by the elimination of sugar. Another harm of high glycemic foods is the rapid absorption of sugar into the blood. Studies have demonstrated this rapid absorption to promote excessive food intake leading to obesity in its subjects. In other words, it causes people to eat way too much. 2. Sugar is linked to heart attacks. Compounding sugar’s strong correlation with high systolic blood pressure and heart disease, patients who suffer from these illnesses should be dually concerned. Sugar has been correlated with a significant rise in total cholesterol and triglycerides. The rise in cholesterol is specifically due to a rise in bad cholesterol (LDL) and a decrease in good cholesterol (HDL). 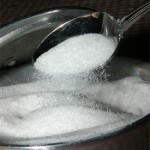 Sugar also increases the size of your liver by making your liver cells divide; this increases the amount of liver fat. All of these changes negatively affect cholesterol and heart patients. 3. Sugar is linked to diabetes. Those who have higher amounts of sugar in their diet score higher on their fasting glucose tests and have reactive hypoglycemia. The reason for these finding is because sugar decreases your insulin sensitivity thereby causing abnormally high insulin levels in the blood. These strongly predispose to diabetes. 4. Sugar harms the whole digestive tract. Patients with problems anywhere along their digestive tract, such as candidiasis, any of the inflammatory bowel diseases, or tooth decay and periodontal disease, always benefit from the elimination of sugar from their diets. The reason is because sugar is a good source of energy for candida, is harmful for the gut by supplying energy to pathogenic bacteria, and causes saliva to become acidic, respectively. 5. Sugar makes you age faster. Loss of tissue elasticity and function is another effect of sugar causing the skin to look older prematurely. The way sugar affects skin is by altering the collagen in the skin cells themselves, a process difficult to reverse. Sugar has the potential of inducing abnormal metabolic processes in a normal healthy individual and to promote chronic degenerative diseases. 6. Sugar is linked to premature births. High sugar consumption of pregnant young females has been observed to lead to premature births and children that are small for their gestational age at delivery. Sugar’s affect on children therefore begins before delivery and continuously affects their growth and development, as this article explains. Furthermore, sugar is correlated with increased occurrence of childhood eczema, the elimination of which is recommended in the dietary therapy for the skin disease. The mechanism of action has been supposed to be linked to sugar’s effect on bowel movements: as transit time of stool increases in the body an important channel for detoxification is hampered. On the other hand, as children’s bowel movements become more regular, their bodies detoxify waste products more efficiently thereby benefiting the health of the skin and body as a whole. 7. Sugar has been found to be linked to many more harms on the body as well, including but not limited to the following: weakened eyesight, cataracts and nearsightedness , gallstones, hemorrhoids, varicose veins, osteoporosis, and early hair loss. Sugar is not a healthy substance to have in the diet. Any nutritious diet should avoid or severely limit the use of sugar. To improve eating habits consume calories that will prove beneficial to your body and experiment with well-thought out replacements. For a sweet snack, enjoy some fruit instead of candy or bake using honey, molasses, or stevia leave powder in the place of sugar. Try brown, whole grains as your staples instead of white bread or white rice or perhaps even replace the rice altogether with green vegetables as a side instead. Replace soda with water or other non sugar drinks. These little substitutions added up can go a very long way and one may be pleasantly surprised how much more energy in the muscles, and less fat on the belly, one is being accompanied by throughout one’s day.